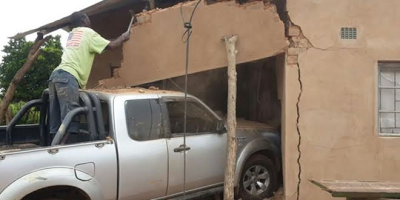 A Zimbabwean man who works as an office administrator at Kana Mission hospital in Gokwe South has killed himself after his wife drove their family pick-up into the house killing his mother and a visitor. The deceased, Delani Ngwenya who reportedly committed suicide on Sunday, January 29, 2017, is said to have recently bought the vehicle and decided to teach his wife how to drive. But his wife accidentally rammed into the family house killing her mother in law and a visitor. According to a source who witnessed the tragic scene, he said Delani who couldn't withstand the loss of his mother hanged himself after the wife mistakenly stepped on the accelerator instead of the brakes while he was teaching her to drive. 'It is said that Delani recently bought a car and was teaching his wife to drive and upon reaching his home yesterday afternoon she mistakenly stepped on the accelerator instead of the the brakes thereby driving straight into the house where Delani’s mother, a visitor and his father were sitting, 'Mrs. Ngwenya, Delani’s mother and Mrs. Chamunorwa the visitor died on the spot and Delani could not stomach the loss thus he hanged himself,' he said.